DANNY WAYNE: I’m Danny Wayne. DEE DODD: And I’m Dee Dodd from the WILL Center. WADE WINGLER: Hi, this is Wade Wingler with the INDATA Project at Easter Seals Crossroads in Indiana with your Assistive Technology Update, a weekly dose of information that keeps you up-to-date on the latest developments in the field of technology designed to assist people with disabilities and special needs. 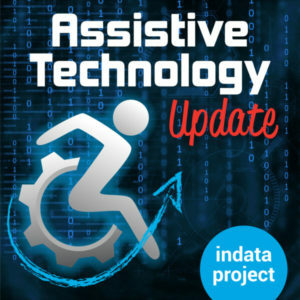 Welcome to episode number 375 of Assistive Technology Update. It’s scheduled to be released on August 3, 2018. Today our guest is Danny Wayne Beemer and Dee Dodd who are with the Wabash Independent Living and Learning Center out of Terre Haute, Indiana. They are going to talk today about lighting. We also have a story about accessible voting and remote ballot marking. And an app from our partners at BridgingApps. Something we’re doing new and different today, guys, I am actually out of the studio for the recording of this interview today, so I have leaned on my good friend Josh Anderson, who you might remember his voice or be familiar with it. He is not only the manager of our clinical assistive technology program here, but he’s also a frequent panelist on ATFAQ, our question-and-answer show, Assistive Technology Frequently Asked Questions. Josh was successful in wrangling the microphone away from me for this interview. I’ll be back next week. But in the meantime, Josh has the mic and will handle this interview. We hope you’ll check out our website at www.EasterSealsTech.com. Send us a note on Twitter@INDATA Project. Or call our listener line. We love your questions and comments. You might even hear your voice right here on the show. The number is 217-721-7124. We don’t just do podcasts. We also have a YouTube channel and a blog. In fact, if you head on over to EasterSealsTech.com, you’ll see we blog about one of our partner agencies, PATINS, which does a lot of assistive technology in the K-12 space. We’ve had a blog post about the relief band 2.0 wearable for nausea. We’ve had some tech tips on our YouTube channel about the C Pen examined reader. And we even talked about a thing called Mindly that gets you some help organizing your thoughts, ideas, and more. In fact, every Monday through Friday, we have all kinds of content coming out on our blog. Super easy to find it. Head on over to EasterSealsTech.com. One of our favorite places to get information about assistive technology is the AT3 Center blog. I got a story that is part of a series called “AT Tip for Voting: Remote Ballot Marking.” It’s written by Eliza Anderson. They’ve done a whole series of tips on how to make voting more accessible. With the 2018 midterm elections coming up here in the US, that’s an important thing. In this series, they talk about remote ballot marking, which is a way to allow people who use assistive technology to use and accessible digital bell on their home computer. The real kicker is they can use their own assistive technology because it is on their home computer. These ballots aren’t submitted electronically. They are actually printed off and sent into the office by mail, but it does do with the whole issue of privacy and independence in voting, which is a great thing. The blog post talks about a list from the AAPD about states that provide accessible remote ballot marking. It is not here in Indiana, but it is in California, Hawaii, Maryland, New Mexico, Ohio, and Oregon. And on this blog post, they actually have a video from Disability Rights Oregon that talks about remote accessible voting and some of the ins and outs of that. I’m going to pop a link in the show notes over to the AT three Center blog dated July 24, 2018. The authors Eliza Anderson. You can learn more about remote ballot marking and think about the accessibility of voting. Get out the vote. It’s important guys. Check our show notes. WADE WINGLER: Each week, one of our partners tells us what’s happening in the ever-changing world of apps, so here’s an app worth mentioning. AMY BARRY: This is Amy Barry with BridgingApps, and this is an app worth mentioning. Today I am sharing an app called Cozi Family Calendar. Cozi as a family from the planning app that allows families or individuals to easily organize their calendar, lists, recipes, and more, all in one place. Cozi is a great assistive technology apps for helping manage busy families. We trialed the app with a family with special needs and found it to be very useful in keeping up with therapy and doctors appointments. Cozi is free to download, however, there is an option to upgrade to the gold version of the app, which offers users more features such as a monthly calendar view, birthday tracker, contacts, and more. The gold version is also at free, and the cost is $19.99 a year. The central feature of the app is the calendar. With the free version of the app, the user is able to see the calendar in a weekly view. Users and family members can add events to the calendar. Calendars are color-coded, and each family member can also have their own individual calendar. Users can also create shopping list and to do lists within the app. Our favorite feature of the list is the ability to share them with users by text message. This makes it easier to share lists with family members on the go. Another one of the highlights of the app is the Mills a section. This is great for families with picky members. Users can search for recipes and add them to the family recipe box. They can also add their own recipes from scratch or from a URL. Recipes can then be added to the family calendar as a meal for the day. Cozi is available to download for free at the iTunes and Google play stores, and the app is compatible with both iOS and Android devices. For more information on this app and others like it, visit BridgingApps.org. WADE WINGLER: And again, as I mentioned in the intro, Josh Anderson is going to handle our interview today. You’ve heard them on ATFAQ, but today he is going to interview Danny Wayne and Dee Dodd. JOSH ANDERSON: Hello everyone. We are very excited today to have Danny Wayne Beemer and Dee Dodd here today from the Older Blind Program with the Wabash Independent Living and Learning Center. We are going to talk about one of the original pieces of assistive technology, light. Welcome to the show, guys. DANNY WAYNE: Great to be here. Thank you very much. DEE DODD: Yes, thank you. JOSH ANDERSON: Dee, this is actually your first time on the show while Danny has been here before. What you tell our listeners something about yourself. DEE DODD: I started working for the WILL Center about six years ago, crossed over, started working with Danny almost 5 years ago. I’m currently a full-time student studying psychology, but I’m very passionate about working with the older blind community. JOSH ANDERSON: Very nice. Danny, for those listeners who don’t know about you, tell us about yourself. DANNY WAYNE: I’m Danny Wayne Beemer with Wabash Independent Living and Learning Center. You heard the words “WILL Center.” In Indiana, there are several independent living centers funded by the Indiana Family and Social Service Administration. The grant that Dee and I work on is called the older blind grant, helping individuals that are north of 55. We spent quite a bit of our time on that. Over the next few minutes, you’re going to learn more about lighting. Josh, I have a question for you. How many lightbulbs would you say the average person has in their home? DANNY WAYNE: Average person. Think about that. You’ve got kids, a house that is spread out. What you think? JOSH ANDERSON: I don’t know. 25? Maybe? DEE DODD: They are counting inside and outside think about porch lights as well. JOSH ANDERSON: Are we talking about those solar lights that I have in the back? DEE DODD: Just ones that screw in. JOSH ANDERSON: Just ones that actually screw in? Goodness. 30, 40? I’m trying to think. We have a chandelier with quite a few. It probably has 10 or 15 just by itself. DEE DODD: You’re getting closer. It’s actually 49. DANNY WAYNE: That’s according to Duke energy and General Electric. The average person has 49 lightbulbs in their house. Over the next few minutes, we are going to talk about the variety of lighting and talk more in detail about different types of lighting, trial and error, and more. We are pretty excited to be here. We also had a partnership with Indiana State University’s occupational therapy program. A lady by the name of Paula Gerard worked with us using a device called the LuxIQ. We’ll get into that in a few minutes on how that can be a lighting assessment tool for an individual or an agency organization providing services to individuals that are sensory challenge. JOSH ANDERSON: Very cool. I look forward to it. Just to start off, what are the different types of light? DANNY WAYNE: There are a couple of different ones. I’m going to talk first about indirect lighting. That can be anything from windows or lighting above you. Indirect lighting, that’s number one. DEE DODD: What Danny just talked about was ambient lighting. I’m actually going to cover what is called direct lighting, also known as task lighting. That would be you are sitting at your office desk and are needing a lamp to project onto what you’re doing to give you more light. JOSH ANDERSON: Danny, what about the ambient light? DANNY WAYNE: It’s something that obviously you have a little bit of control over. Somebody can open their window, and the sun will be coming in, or open it in the afternoon where the sun has already creeped around to the other side of the house, but this is not good light flow into the house. Josh, you’re a parent. I’m going to ask you this. A person with healthy eyes, they need 15 times more light than the kids do. I would ask you: how many times in your occurrence with your kids and they give you something, dad, what does this say? And you are like, let me go get this into the light. I can’t see it the way it is. JOSH ANDERSON: All the time. I’m constantly running in behind them, turning on the lights in the room, and everything else. I don’t think the notice when the sun goes down. I don’t know what age that kicks in, but it somewhere after 17. DANNY WAYNE: I think you’re right. The average person with healthy eyes needs 15 times more light than their children do. DEE DODD: You’re going to find one working with visually impaired adults that most individuals that are visually impaired require between 1000 to 7000 lumens to read. That’s what light puts off, is lumens. We are going to talk more about that. Most houses, when you enter them, they have between 5 to 600 lumens, so it’s not close to what an individual who is visually impaired requires. JOSH ANDERSON: Talking about lightbulbs, you said how many we actually have in our house. I know when I go to Lowe’s, Home Depot, anyplace, I’ve got aisle upon aisles of all different kinds of lightbulbs, small ones, just different types. What are the different types of lightbulbs, and how do they differ? DANNY WAYNE: There are a lot of different choices. I’ll have Dee go into that a little more detail. I think there are five different choices? DEE DODD: Yes. There are five different types of lights. There is incandescent, CFL, halogen, fluorescent — but what we are finding being used the most and most efficient as LEDs. That’s what we are using and putting in people’s homes nowadays that we find are the best a lighting for them to use. JOSH ANDERSON: When you say best lighting, what makes them so much better than the others? DEE DODD: A uses the least amount of energy. They don’t get hot when it comes to the touch. And when it comes to glare, there is not a lot of glare. They actually find that when it comes to completing a task, it puts off — they can select, depending on what type of lumen or kelvin, but they can select which type of kelvin, which is your softness or harshness of the bold. DANNY WAYNE: Sometimes it comes down to trial and error. That’s exactly what Dee is talking about. You have to depend on what type of project they want. Going through and doing the lighting assessments that we do from a grand we received from the Wabash Valley community foundation, we are focused more on task lighting. Again, it comes to trial and error in so many different ways. DEE DODD: We tell individuals, go to the store, buy a bulb, the lamp, try them. If they don’t work, save the receipt and bring it back. That’s basically the only way you are going to find what works for you. JOSH ANDERSON: For sure. You guys talked about the difference and the lighting and we talked about the LEDs. What are the other kinds that are out there? DEE DODD: The other kinds that we talked about, a lot of them most people don’t use nowadays. Halogen, CFL’s, those are some of your older lightbulbs. They required a lot more watts, which we all grew up with that term, which is the amount of energy that’s being used to use that lightbulb. That’s kind of why we steered away from those lightbulbs. But people still do use them, just not a lot in the low vision community. JOSH ANDERSON: I’ve got you. I can remember when CFL’s first came out, they were great because they use less power than the incandescent. Then the halogens, but they were always very hot. You talked about lumens, wattage, kelvin. What are all those things? What do they mean and why are they important? DEE DODD: Lumens are actually how much light the lightbulb is producing. When we use that LuxIQ that we spoke about — that’s actually an assessment tool — there are two levers that the individual can play with to change the lighting when they are reading either a newspaper or something underneath this machine. One of them is the lumens, which is going to determine how much practice they need, and the other is the kelvin, which is going to determine the softness or harshness they need. That gives us an idea of what type of bulb to buy. DANNY WAYNE: So many times when you go out looking for bulbs, it’s like the stereo system when you and I were kids. They said how many watts will the speakers take? Today it’s not about the watts, it’s about the output of lumens. There is a broad range there. It’s something like 5 to 600 lumens and a home, for your lumens can go as bright as 5 to 7000. DEE DODD: The daylight sky can produce anywhere from 15 to 27,000 lumens on a clear day. DANNY WAYNE: A computer screen has quite a bit less than that. DEE DODD: It’s about 79,000. DANNY WAYNE: You get kind of an idea. Instead of looking for watts anymore, and on the package — Dee is going to get into the labeling here and what to look for. Next time you pick up after listening to this conversation, next time you pick up a package, you will certainly have a little better understanding an idea. It does break it down — I think sometimes some of these LED bulbs are using 7 to 12 watts? DEE DODD: Yeah. You can buy — an example would be to go out and look at a general electric bulb. It would be an LED. On the package in the very corner, usually on the front, it will show brightness and say 1700 lumens. Right beside that, it will give you an estimated energy cost. This is only $2.05 a year, which is drastically different compared to what it used to be. That is usually a 43 watt bulb. They are saying what used to be 43 watts is not only a 17 watt bulb. It’s using a lot less electricity. JOSH ANDERSON: Very cool. How do the LEDs use so much as power? Less wattage? How are they made differently? Is there a major difference? DEE DODD: I would say there is a major difference. I think a lot of it has to do with the filaments on the inside of the bolt. We haven’t researched a ton on how they are made, to be honest with you. We just know how much energy efficiency they use and how they help the low vision. DANNY WAYNE: It’s the technology that has changed. Just like the things we talk about, whether with phones or communication devices, technology has been done. I read an article recently that said if all of the United States would go to LED Christmas bulbs, we would save $1 billion a year. JOSH ANDERSON: Just over Christmas time? DANNY WAYNE: Yes. They are so efficient these days. We talked about lumens, Dee. What’s kelvin? It’s not Calvin and Hobbs, right? JOSH ANDERSON: When I think of that, I remember something from science class of some temperature kelvin and it friends me when you say things like that. What does that actually mean in the world of light. DANNY WAYNE: We are going back to school. JOSH ANDERSON: I am. My hands are sweating. You just talk about statistics and I’ll probably try. DEE DODD: Kelvin actually is color temperature. That’s what it stands for. When you are choosing the right bulb, you want to make sure that, whatever you prefer, whether it be a warm light which is ranging from 2700 kelvin or a more daylight, like you can see better in the daylight, you are wanting more of the 6500 kelvin. It would depend on what your preferences are. The lower you get, the softer the bulb is going to be. The higher you get, the harsher the light is going to be. JOSH ANDERSON: And are any of those more important for time of day or anything like that? Or is it just personal preference? DEE DODD: Time of day is a big thing. I tell my people all the time, try your bulbs during the day. Try them at night. You might find that one lamp works better for you during the day or one works better for you during the night. Like he said, a trial and error. JOSH ANDERSON: Trial and error seems to be a big thing. DANNY WAYNE: It’s interesting that you would bring that up. I know on this show, you guys talk about smart devices. There are smart bulbs out there. They are expensive now, but five years from now they might not be. In the morning, you can get more exposure to a blue light, and then it shifts throughout the day and afternoon, the contrast. DEE DODD: We found that’s actually important in the low vision community, especially in the totally blind, that people do actually need a certain amount of blue light. They’ve taught us that blue like can be dangerous for you, but there is a condition called seasonal affective disorder — or in the blind community non-24. That causes fatigue, depression, sadness. They’ve talked about how you do need to go out, even if you are totally blind, and get into some type of daylight. Or they do have lamps that produce that as well. Danny and I ran across one called that Verilux Happy Lamp. You can actually shine that to the front of your legs for about 15 minutes a day. It needs to be about 24 inches from your skin. They say after a couple of weeks, you’ll start to notice the you feel a little better, less fatigued, and it will help with depression. JOSH ANDERSON: It almost gives you the sunlight? Very nice. DANNY WAYNE: I have to throw a plug in here. Elaine Cutler who was doing a lot of research at the American printing house for the blind in Louisville Kentucky has an a lot of research on that. It’s our understanding that that really helps people who are sensory challenge to get their bio-rhythm and balance. JOSH ANDERSON: Very nice. Tell me a little bit more about the labeling. I know you said up in the corner it’s got the information on lumens and things like that. What about Calvins? Where is that? DEE DODD: That’s on the back of your box. You will see a scale, and it will show you. It’s will usually start around 2700 to the 5000. You’ll see a scale. Usually there will be an arrow that points to where that bulb’s kelvin is at. It will give you an idea of where that bulb is, if it’s at 2700 or closer to the 500, depending on the softness or harshness of the bulb. JOSH ANDERSON: Very nice. What about bulbs that are adjustable? I think of dimmer switches and things like that. Does it matter what kind you go with as far as bulb if you’re using those? DEE DODD: Yes. Because even though it is a three-way bulb, it is still going to put out the same amount of kelvin. It is not going to put out the same amount of lumens. JOSH ANDERSON: I’ve got you. So it is very important and those different ones. DANNY WAYNE: That’s the one thing this device called the LuxIQ — and you can research it and do a Google search for it. It’s about $900 for that device. What is handy about that is when we are in someone’s home, we can literally do a lighting assessment in a few minutes. In fact, we were at the American Council for the Blind’s national conference, went up to one of their suites. And just about 10 to 15 minutes, we did three different assessments. DEE DODD: I did three assessments. I do for one people that it’s best to be done in the home or the area where they are wanting concentrated on that light because it is very hard. Every room is different, every person is different, every situation is different. I did do three quick assessments and at least give an idea of what type of bulb that would be best for them. DANNY WAYNE: This device is really portable, probably 12 inches by 14, battery-operated. Justin vision, there are two sliders, one on the top four lumens, one on the bottom for kelvin. She can go through and in a matter of minutes adjust the lumens to give someone an idea of what that means. When you say color, I’m picturing green, blue, red, yellow, pink lights. But it’s not necessarily that. DEE DODD: No, it’s not. I’ve actually seen it will increase the font of what they are able to read. I will stick something underneath it, and they will be reading at, say, a 26 font, and as they play with the lumens and kelvin, I can sometimes get them down to where they can read a 12 font print with this device this by playing with the light. JOSH ANDERSON: Not even changing the color of the printer anything? JOSH ANDERSON: Very amazing. You guys talked about helping some individuals do a couple of assessments and things like that. Can you tell me a couple of cases where you’ve used the specific lighting types to help people with their goals? DEE DODD: Our first case was a lady who is homebound. She’s a little older and mobility is a struggle for her. She really enjoyed crocheting and crafting and color therapy, so we went into her home and did the assessment. I was able to get her — unfortunately, we have found we needed to get a five headed lamp to get the amount of lumens that they require. One bulb is never going to get 5 to 7000 lumens. One bulb is not going to get that. We got a five headed lamp, and I put that over a chair. She was able to see so much better that she could crochet and keeps bringing Danny and me things that she has crocheted recently. We got her a small task lamp that she was able to do her color therapy with that she really enjoyed. That was one of our first ones. Danny has under the lady we helped. DANNY WAYNE: There was a lady in Putnam County, very well-educated, very independent, had a beautiful, large house. She wanted to do more work in her kitchen. She wanted to do food preparation since she wanted to do some of her organization there. We focused on task. It was part of task lighting where she could have it on her kitchen counter when she was preparing food or cutting up food and having a lot of concentrated light on that. But that she also could do her bookkeeping or keep track of her receipts. We really found much difference. That’s two extremes. You got a lady who wants to do coloring, under the lady who is a food preparation quest for lighting. Both of those have been successful. JOSH ANDERSON: Very nice. You guys have given a lot of information today on lighting and everything. What did we miss? DANNY WAYNE: I think one of the things to encourage people that we can’t stress enough is it is trial and error. Dee, there was one of the story that you had with the lady that made a difference to increase her reading. DEE DODD: I had one lady in particular that really struggled to see the newspaper, to see her closets or pantries. We actually found that small LED flashlights helped tremendously. She was able to shine them, get a close-up, and she could read much better with her newspaper or in her pantry on her shelf. Then we were also able to purchase a headlamp. That way she could put it on her head, hold the newspaper out and see and read much better. She was so happy. She missed reading the newspaper. DANNY WAYNE: Once the agency you work with or whoever you have to the light assessment, you’ll find a lot of these products are commercially available. I think, Dee, you spent a lot of time in national box stores as well as you talk about the headlamp. That’s come to be more of a common thing. I remember a gentleman said, I just put the flashlight in my mouth and use my hands. I remember back, Fester used to put the lightbulb in his mouth on one of those shows. Obviously there are better ways to do it now. JOSH ANDERSON: For sure. Those things are nice. I’ve always said that my dad taught me how to fix cars. I can hold the flashlight with the best of them. I can’t do anything else, but I can do that and keep in the right place. Lighting is very important. I really do appreciate you guys taking time out of your day here to meet with me. If somebody would actually want to get in contact with you at the WILL Center, what’s the best way to get in contact with you? DEE DODD: They can either get a hold of us at thewillcenter.org, or they can call us at 812-298-9455. Or we have a Facebook page at WILLctr. DANNY WAYNE: We would love to take time to talk with you. Get in touch with us. I am visually impaired. I have significant vision loss. Lighting is really important to me. Dee and I have been in so many different people’s homes. Some of them have good lighting, and some of them — we were just in a lady’s house the other day. We know we can make a difference with her with lighting. It’s just finding the funding resources because they get to be expensive after a period of time. We want to help. JOSH ANDERSON: Very cool. Danny, Dee, I can’t thank you enough again for coming on the show today. We look forward to talking to you sometime soon. DANNY WAYNE: Thank you very much.